05 Oct 2017 / 19:39 H.
SHAH ALAM: VX (nerve agent) poison as well as its precursor and degradation elements were discovered on the clothing items of both murder accused Siti Aisyah, 25, and Doan Thi Huong, 29, the High Court heard during the trial on the murder of Kim Jong-Nam here today. 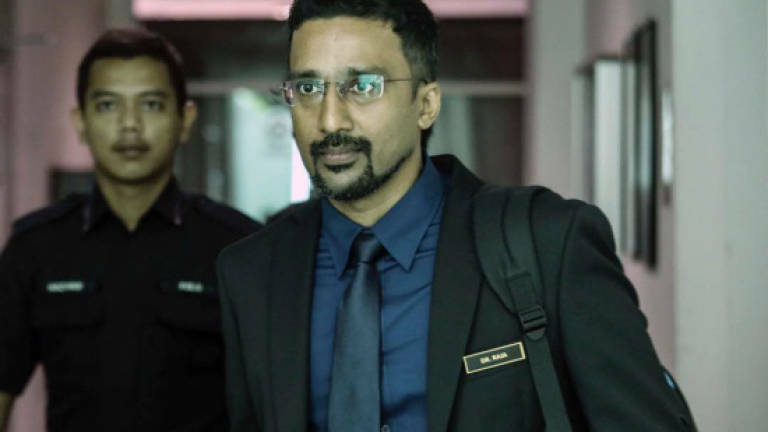 Chemistry Department’s centre of chemical weapon analysis, lab head Dr Raja Subramaniam, 42, confirmed that degradation elements of VX were found on a sleeveless T-shirt belonging to Siti following a lab test conducted on case items which included clothing on the suspects. Raja who is the eighth witness in the trial, also confirmed that Dian’s white jumper with the “LOL” motive had traces of VX poison as well as precursor and degradation elements of VX. Traces of degradation elements were also discovered on the fingernail samples obtained from Doan. When asked by deputy public prosecutor Wan Shaharuddin Wan Ladin on the meaning of precursor and degradation elements against VX, Raja said the elements confirmed the presence of VX substance. “It is the deadliest nerve agent created. Just one drop containing 10mg is enough to cause fatal disruption to the nervous system,” he said. Describing VX further, Raja said the nerve agent was easy to transport as it could be easily carried in a mineral water bottle. “It is very difficult to detect as it is (an) odourless, colourless and tasteless oily liquid in its pure form. “A drop of VX takes about six days to evaporate. The lower the temperature, the harder it takes to vapourise,” he said. Asked by Wan Shaharuddin on measures to be taken if a single drop of VX comes into contact with human skin, Raja said following human testing, the affected person must wash their hands with running water and scrub the affected area for at least 15 minutes to ensure decontamination. “VX can penetrate much faster through the head, neck, eyes, ears, inhalation, ingestion and through injured skin compared to the skin surface on the forearm, hands and feet. “This is due to the combination of greater blood proximity and less fat deposits in those said areas,” he said. Due to those factors, Raja pointed out that VX poison will penetrate the cheek 26 times faster in comparison to the palm of a hand. Indonesian Siti and Vietnamese Doan, along with four others still at large, were charged with the murder of Kim Chol, 45, at the KL International Airport 2 (KLIA2) departure hall at 9am on Feb 13 this year. It was reported that Jong-nam was at KLIA 2 on Feb 13 to board a flight to Macau when two women approached and suddenly wiped his face with toxic liquid which was later identified as the VX nerve agent. Jong-nam, who travelled with a passport bearing the name of Kim Chol, died while on the way to the Putrajaya Hospital. He arrived in the country on Feb 6. The murder charge under Section 302 of the Penal Code carries the mandatory death sentence upon conviction.